You can see how to create a DSN to connect to Drill data sources by taking a look at the preconfigured sample that the installer sets up. If you want to create a DSN for a 32- or 64-bit application, you must use the 32- or 64-bit version of the ODBC Data Source Administrator to create the DSN. 1. 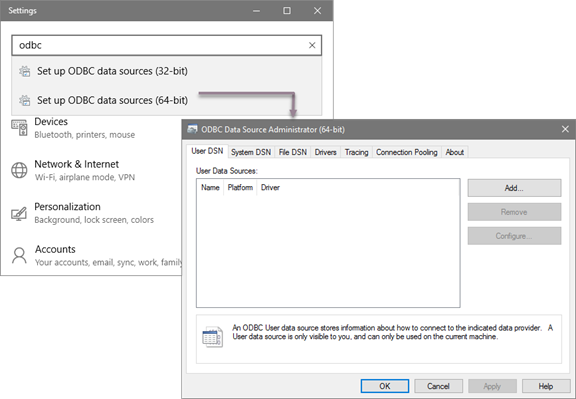 From the Settings dialog in Windows 10, enter odbc and select Setup ODBC data sources <version>. The ODBC Data Source Administrator <version> dialog appears. 2. On the System DSN tab in System Data Sources, select MapR Drill. The system DSN is available for all users who log in to the machine. A user DSN is available only to the user who creates the DSN on the User DSN tab. 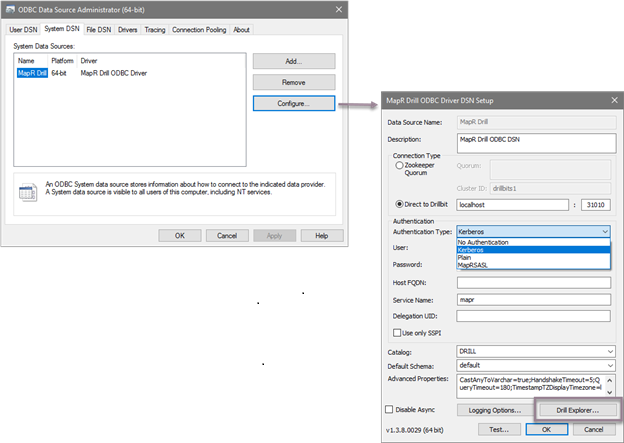 The MapR Drill ODBC Driver DSN Setup dialog appears with a preconfigured sample DSN. The following image shows a possible DSN configuration for using Drill in embedded mode. To access Drill Explorer, click Drill Explorer.... See Drill Explorer for more information. To password protect the DSN, select the appropriate authentication type in the Authentication Type dropdown. If the Drillbit does not require authentication (or to configure no password protection), you can use the No Authentication option. You do not need to configure additional settings. Kerberos - configure Host FQDN and Service Name properties. To specify the default Kerberos mechanism, select the Use Only SSPI checkbox. To use MIT Kerberos by default and only use the SSPI plugin if the GSSAPI library is not available, clear the Use Only SSPI checkbox. Plain Authentication - configure UID and PWD properties. Check the drill-override.conf file for any port changes. Quorum - A comma separated list of ZooKeeper nodes in the following format: <host name/ip address> : <port number>, <host name/ip address> : <port number>, . . . Cluster ID - Name of the drillbit cluster. Check the drill-override.conf file for ZooKeeper node information and for any cluster name changes. Check the drill-override.conf file for the cluster name. The Advanced Properties section describes the advanced configuration properties in detail. Select the Disable Async option to disable the asynchronous ODBC connection and enable a synchronous ODBC connection for performance reasons. By default the ODBC connection is asynchronous (Disable Asynch is not checked). A change in state occurs during driver initialization and is propagated to all driver DSNs. For information about logging options, see Logging Options.